NICOLE RICHIE NEWS: Nicole Richie: Everybody should wear headpieces! 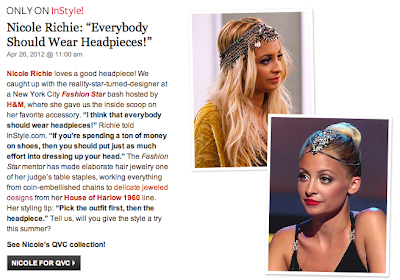 Nicole Richie: Everybody should wear headpieces! where can we find the same headpieces ?? please beacause i'm in love especially with the second headpiece like nicole wears !! The headpieces Nicole is wearing on these pics are custom made HOH1960. If you visit http://www.shopthetrendboutique.com/hoofha19.html?page=0&sf=&sd=a#sortblock they have some great headpieces designed by Nicole Richie.